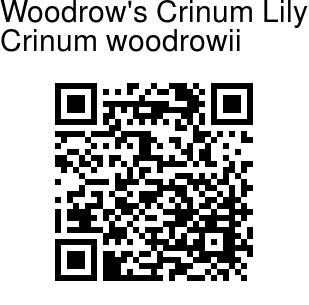 Woodrow's Crinum Lily is a rare and critically endangered bulbous plant, which was thought to be extinct, but was rediscovered in 2004, after a gap of about 100 years! G. M. Woodrow first collected this species from Mahabaleshwar. Several bulbs of this were sent to Kew (England) supposing them to be C. brachynema, but when they flowered at Kew the plant proved to be a new species. It is a large perennial herb, growing up to 50-70 cm tall. Strap-like bright green leaves, 30 cm long, 7-10 cm wide, arise directly from the root. Large fragrant white flowers arise on a scape about a foot tall, arising from the bulb outside the tuft of leaves. Flowers are fragrant, 6-7 in an umbel on top of the scape. Flower tube is 7-10 cm, cylindric, petals are are 7-10 cm long, lancelike. The six stamens have red filaments, and are shorter than the petals. Anthers are yellow. 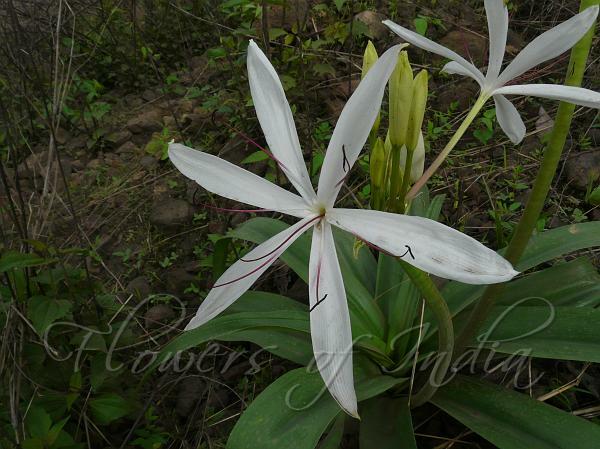 Woodrow's Crinum Lily is endemic to Satara District, Mahabaleshwar and Kates Point in Maharashtra. Flowering: May–July. Identification credit: Dinesh Valke Photographed near Vasai on NH 8, Maharashtra.